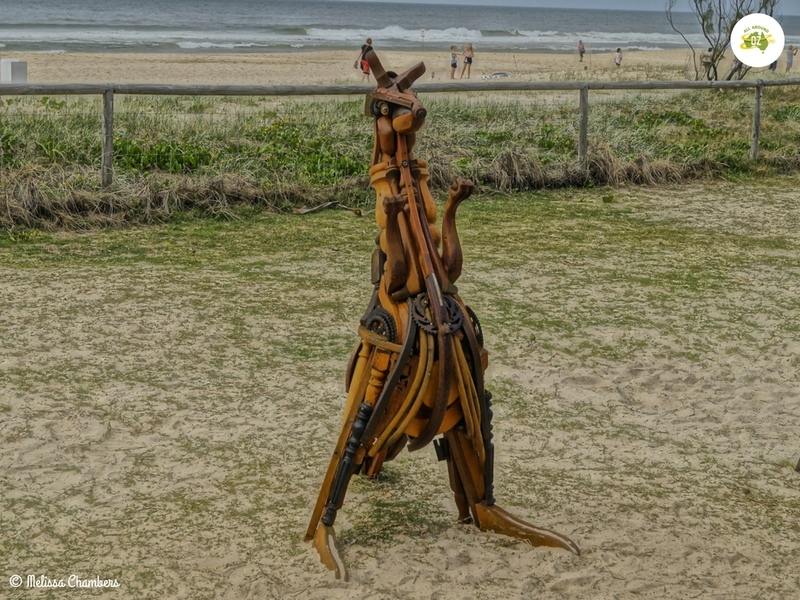 Every year in September the Gold Coast plays host to the Swell Sculpture Festival. After attending last year’s festival for the first time, I couldn’t wait to see what was on offer this year. 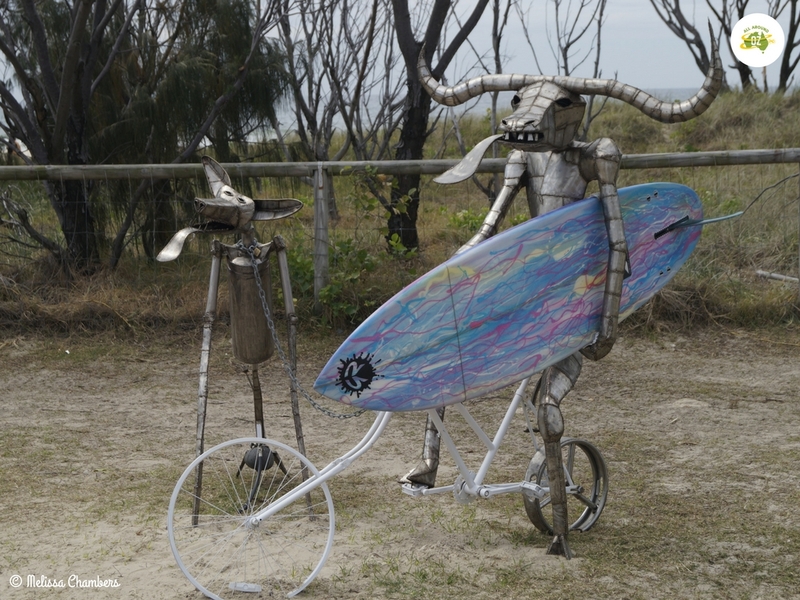 The Swell Sculpture Festival was the creation of Natasha Edwards and Kylie Mitchell-Smith. Their vision was to have art that was accessible to everyone. First held in 2003, there were 23 sculptures on display. The Festival ran over a weekend and attracted about 6000 people to it. The Swell festival now attracts over 250,000 visitors annually. 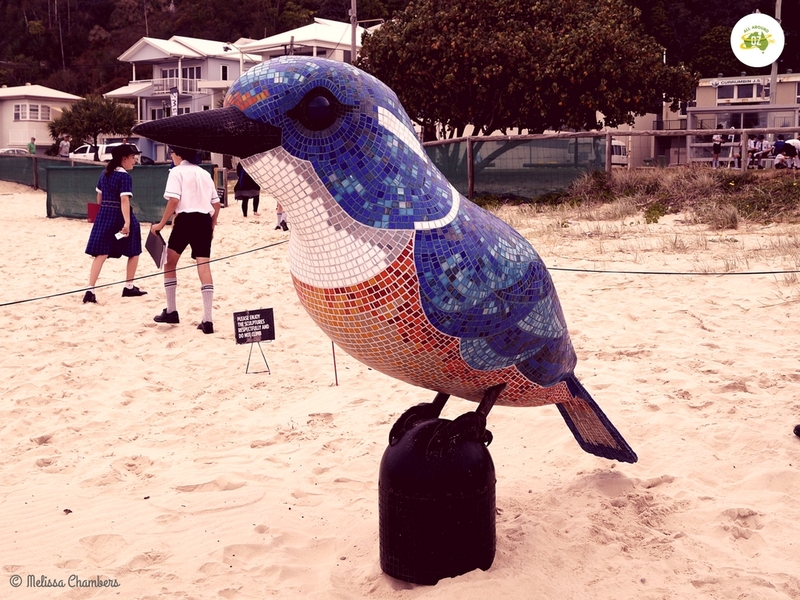 Set right on beautiful Currumbin Beach, this year’s festival featured more than 50 exhibits. This years eclectic bunch of exhibits included a pyramid made of bread trays, about a dozen old washing machines set out on the beach with the title ‘Washed Up’ and a pair of over-sized deck chairs. Not everyone may consider these sculptures to be art. But even if you don’t you can still appreciate the talent and vision of the participating artists. However, I did find that I liked most of what I saw and loved a couple of pieces in particular. ANTI-dote, a cleverly designed and intricate piece by artists Andrew Cullen and Kara Vaughan. 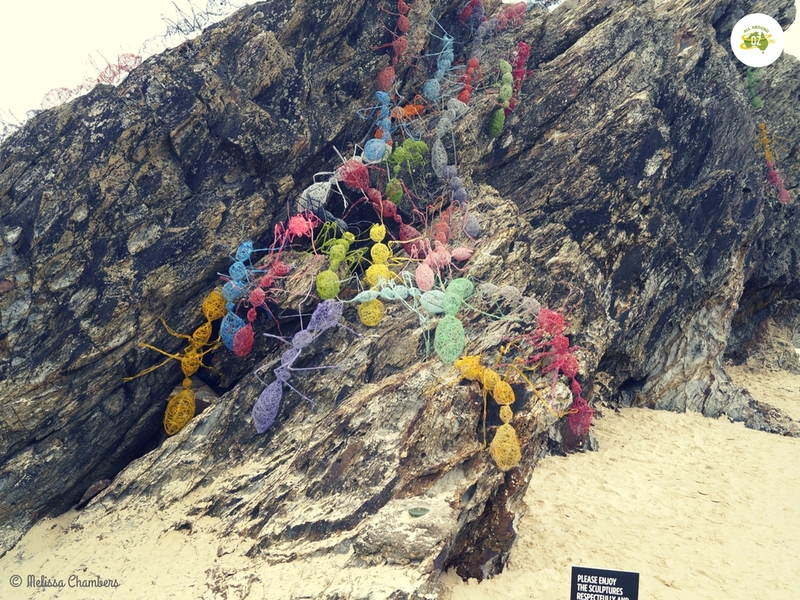 It featured one hundred and twenty coloured, wire ants. The ants were arranged all over a large rock so as it looked like they were crawling on it. Andrew and Kara are teachers at a local Gold Coast high school so several students were involved in the project. ANTI-dote was the winner of the People’s Choice Award. I loved this exhibit by artists Tim Elliott and Kate Millington. The vibrant colours in the tiles used really made this artwork stand out. It was obviously very popular too because I had trouble photographing it without anyone in it. This vibrantly coloured exhibit was created by artists Katie and Derek Hooper. They were the winners of the Jennie Neumann Emerging Artist Award for their efforts. 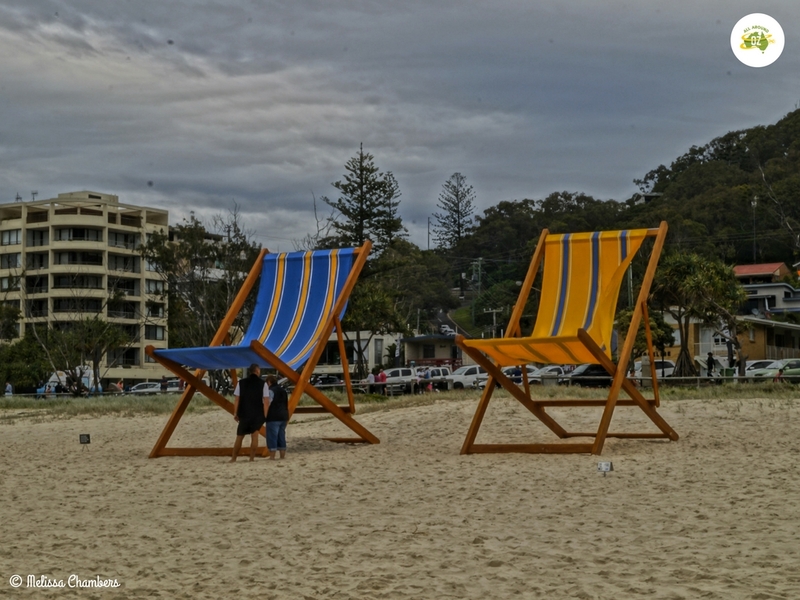 These giant blue and yellow deck chairs really grabbed my attention. Not just by their size either. Created by artist Joe Stark, ‘Swell’s Pumping’ was just one of several artworks on display that utilised recycled materials. On any day, this familiar scenario of pushbike rider, surf board and dog heading to the beach can be seen right across the coastal regions of Australia. I loved the clever expressions on the bull and the dog’s faces. This was just so clever! I loved how realistic this stylized kangaroo looked. Artist Nick Warfield utilised furniture legs and sprockets to create Gangarru. Our favourite marsupial is an iconic part of Australia and Nick’s sculpture really reflects that. Next year the Swell Sculpture Festival will celebrate it’s 15th year. I really can’t wait to see what’s on offer in 2017. The festival will run from 8th to the 17th September. I highly recommend making the trip to Currumbin Beach for the Swell festival. This year the entries were exceptional, particularly the ants of the rockface. It is a really cool festival and so suitable for the Gold Coast with its gorgeous Currumbin Beachfront. The ants were definitely my favourite….so clever. Can’t wait for next years. I love going to these sorts of events. Looks great! Yes me too! I would love to go to the one in Sydney as well. Great read. I have in my sights a trip down to the Gold Coast next year just to see Swell. It’s a fantastic day out. We can check it out together!